I'm not sure if it's the holiday season that's proving the benefactor of these great art-books we're getting, but I'm not complaining. 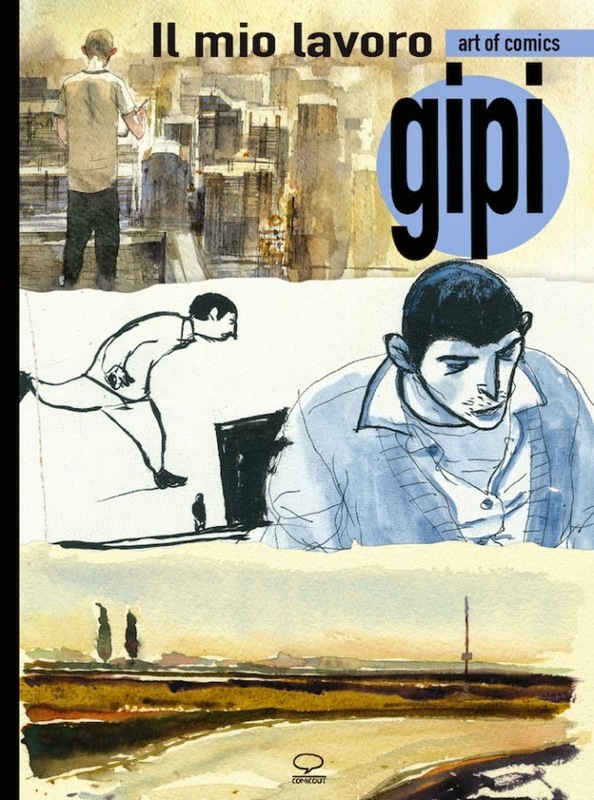 My copy of this is already on the way, and I'll attempt to report back at some point, but for now here's a quick look at what to expect from Il Mio Lavoro ('my work') the new art-book from contemporary Italian comics master, Gipi (Garage Band, Notes on a War Story, The Innocents, They Found the Car). From what I can gather, Il Mio Lavoro is the first in a new series of international bilingual (Italian and English), art-books from publishers Comic Out, under the subheading of 'art of comics,' which will spotlight the work of several artists working in the medium, and what better way to kick off than with Gipi, who is appreciated and acclaimed by audiences around the world. The book, edited by Laura Scarpa, promises to offer new illustrations, sketches, project designs, and preparatory drawings, as well as comments on his art and watercolor technique from Gipi himself. Running to 160 pages and 21 by 29.5 in size, as with the Kerascoët's Paper Dolls, one of the aspects that appealed to me -apart from it being a book collating Gipi's art!- is that it is largely pictorial, which may sound rather daft, but some art-books do contain essays and so forth, which I find frustrating if they're in a language I can't read. However, Comic Out have designed this series with an eye towards international accessibility which apparently means that the accompanying inscriptions are reproduced in both Italian and English. You can buy it from the Comic Out website, and if that's not an option available to you for whatever reason, it's also stocked by Amazon. I imagine it would make a pretty neat gift, too.